Kent /ˈkɛnt/ is a county in South East England, and one of the home counties. The ceremonial county boundaries of Kent include the shire county of Kent and the unitary borough of Medway. Kent has a nominal border with France halfway through the Channel Tunnel, as well as a defined boundary with Essex in the middle of the Thames Estuary. The county also borders Greater London to the North West near the towns of Swanley and Dartford, Surrey near Westerham and East Sussex near Tunbridge Wells. Maidstone is its county town and historically Rochester and Canterbury have been accorded city status, though only the latter still holds it. Kent's location between London and continental Europe has led to it being in the front line of several conflicts, including the Battle of Britain during World War II. East Kent was known as Hell Fire Corner during the conflict. England has relied on the county's ports to provide warships through much of the past 800 years; the Cinque Ports in the 12th–14th centuries and Chatham Dockyard in the 16th–20th centuries were of particular importance to the country's security. France can be seen clearly in fine weather from Folkestone, and the iconic White Cliffs of Dover. Because of its abundance of orchards and hop gardens, Kent is traditionally known as "The Garden of England" – a name often applied when marketing the county or its produce, although other regions have tried to lay claim to the title. Major industries in the north-west of Kent have included cement, papermaking, and aircraft construction, but these are now in decline. Large parts of Kent are within the London commuter belt. South and East Kent rely on tourism and agriculture. Coal mining has also played its part in Kent's industrial heritage. 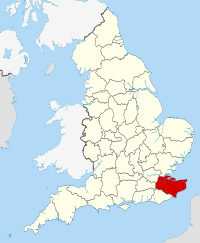 The modern name of Kent is derived from the Brythonic word Cantus meaning "rim" or "border". This describes the eastern part of the current county area as a border land or coastal district. Julius Caesar had described the area as Cantium, or home of the Cantiaci in 51 BC. The extreme west of the modern county was occupied by Iron Age tribes, known as the Regnenses. It is possible that another ethnic group occupied what is now called The Weald and East Kent. East Kent became a kingdom of the Jutes during the 5th century and was known as Cantia from about 730 and as Cent in 835. The early medieval inhabitants of the county were known as the Cantwara, or Kent people. These people regarded the city of Canterbury as their capital. In 597, Pope Gregory I appointed Augustine as the first Archbishop of Canterbury. In the previous year, Augustine successfully converted the pagan King Æthelberht of Kent to Christianity. The Diocese of Canterbury became Britain's first Episcopal See and has since remained Britain's centre of Christianity. In the 11th century, the people of Kent adopted the motto Invicta, meaning "undefeated". This naming followed the invasion of Britain by William of Normandy. The Kent people's continued resistance against the Normans led to Kent's designation as a semi-autonomous County Palatine in 1067. Under the nominal rule of William's half-brother Odo of Bayeux, the county was granted similar powers to those granted in the areas bordering Wales and Scotland. Titlepage of William Lambard's Perambulation of Kent, being a history of the county of Kent since William the Conqueror. For almost nine centuries a small part of present day East London (the North Woolwich, London E16 area), formed part of Kent. The most likely reason for this is that in 1086 Hamon, dapifer and Sheriff of Kent owned the manor and, perhaps illegally, annexed it to Kent. It ceased to be considered part of the county in 1965 upon creation of the London Borough of Newham. The Wealden dome is a Mesozoic structure lying on a Palaeozoic foundation, which can often create the right conditions for coal formation. This is found in East Kent roughly between Deal, Canterbury, and Dover. The Coal Measures within the Westphalian Sandstone are deep about 250 m – 400 m (800 – 1300 ft) and subject to flooding. They occur in two major troughs, which extend under the English Channel where similar coalfields are located. Seismic activity has occasionally been recorded in Kent, though the epicentres were offshore. In 1382 and 1580 there were two earthquakes exceeding 6.0 on the Richter Scale. In 1776, 1950, and on 28 April 2007 there were earthquakes of around 4.3. The 2007 earthquake caused physical damage in Folkestone. As of the 2001 UK census, Kent, including Medway, had 1,579,206 residents and 646,308 households, of which 1,329,718 residents and 546,742 households were within the administrative boundaries. Of those households, 48.9% were married couples living together, 9.0% were co-habiting couples and 8.7% were lone parents; 28.0% of households consisted of individuals, 14.6% had someone of pensionable age living alone, and 30.4% included children aged under 16 or a person aged 16 to 18 who was in full-time education. For every 100 females, there were 93.9 males. The ethnicity of Kent was 96.5% White, 0.9% mixed race, 0.3% Chinese, 1.7% other Asian and 0.4% Black. The place of birth for residents was 94.2% United Kingdom, 0.7% Republic of Ireland, 0.5% Germany, 0.9% other Western Europe countries, 0.3% Eastern Europe, 0.8% Africa, 0.6% Far East, 0.9% South Asia, 0.2% Middle East, 0.4% North America, 0.1% South America and 0.3% Oceania. Religion was recorded as 74.6% Christian, 0.7% Sikh, 0.6% Muslim, 0.4% Hindu, 0.2% Buddhist and 0.1% Jewish, while 15.2% were recorded as having no religion, 0.3% had an alternative religion, and 7.8% did not state their religion. As of the 2009 county council elections, Kent County Council was controlled by the Conservatives, which won 74 of the Council's 84 seats, 7 were won by the Liberal Democrats, 2 by the Labour Party and 1 by the Swanscombe and Greenhithe Residents Association. As of the 2007 local elections, Medway Council was controlled by the Conservatives; 33 of the Council's 55 seats were held by the Conservatives, 13 by the Labour Party, 8 by the Liberal Democrats and 1 by an Independent. Currently, all of Kent's district councils are controlled by the Conservatives; the only British county that is in this position. As of the 2001 UK census, employment statistics for the residents in Kent, including Medway, were as follows: 41.1% in full-time employment, 12.4% in part-time employment, 9.1% self-employed, 2.9% unemployed, 2.3% students with jobs, 3.7% students without jobs, 12.3% retired, 7.3% looking after home or family, 4.3% permanently sick or disabled, and 2.7% economically inactive for other reasons. Of residents aged 16–74, 16% had a higher education qualification or the equivalent, compared to 20% nationwide. The west of the county (including Maidstone, Tunbridge Wells & Sevenoaks) is generally more affluent than the east, especially when compared to the coastal regions of Folkestone, Dover & Thanet. This is partly due to the former's proximity to London, making it prime "commuter belt" and the latter's geographic extremities. The eagerly awaited CTRL 2009 rail service, using the high speed Channel Tunnel line to bring coastal areas' travel times to London down to around an hour, is hoped to further regeneration. Kent has provided inspiration for several notable writers and artists. Canterbury's religious role gave rise to Chaucer's Canterbury Tales, a key development in the English language. The father of novelist Charles Dickens worked at the Chatham Dockyard; in many of his books, the celebrated novelist featured the scenery of Chatham, Rochester, and the Cliffe marshes. The landscape painter J. M. W. Turner spent part of his childhood in the town of Margate in East Kent, and regularly returned to visit it throughout his life. The East Kent coast inspired many of his works, including some of his most famous seascapes. During the late 1930s, Nobel Prize-awarded novelist William Golding worked as a teacher at Maidstone Grammar School, where he met his future wife Ann Brookfield. The county's largest theatre is The Marlowe Theatre, situated in the centre of Canterbury. It re-opened, after being completely rebuilt, in October 2011. With the Roman invasion, a road network was constructed to connect London to the Channel ports of Dover, Lympne and Richborough. The London–Dover road was Watling Street. These roads are now approximately the A2, B2068, A257, and the A28. The A2 runs through Dartford (A207), Gravesend, Rochester, Canterbury and Dover; the A20 through Eltham, Wrotham, Maidstone, Charing, Ashford. Hythe, Folkestone and Dover; the A21 around Sevenoaks, Tonbridge, Tunbridge Wells and on to Hastings in East Sussex. In the 1960s, two motorways were built; the M2 from Medway to Faversham, and the M20 from Swanley to Folkestone. Part of the M25 runs through Kent, from Westerham to the Kent and Essex tunnel at Dartford. The Dartford tunnel has been joined by the Queen Elizabeth II Bridge, together providing four lanes in each direction. The M26 motorway, built in 1980, provides a short link between the M25 at Sevenoaks and the M20 near Wrotham. Kent currently has more motorways by distance than any other county in the UK, with sections of the M2, M20, M25 and M26 totalling 173 km within the extents of the ceremonial county. The two companies merged in 1899, forming the South Eastern and Chatham Railway (SECR). In the aftermath of World War I, the government's Railways Act 1921 grouped railway companies together; the SECR joined neighbouring London, Brighton and South Coast Railway (LBSCR) and London and South Western Railway (LSWR) to form the Southern Railway. Britain's railways were nationalised in 1948, forming British Rail. The railways were privatised in 1996 and most Kent passenger services were franchised to Connex South Eastern. Following financial difficulties, Connex lost the franchise and was replaced by South Eastern Trains and after Southeastern. In addition to the "mainline" railways, there are several light, heritage, and industrial railways in Kent. There are three heritage, standard gauge railways; Spa Valley Railway near Tunbridge Wells on the old Tunbridge Wells West branch, East Kent Railway on the old East Kent coalfield area and the Kent and East Sussex Railway on the Weald around Tenterden. In addition there is the 15-inch (380 mm) gauge, tourist-oriented Romney, Hythe and Dymchurch Railway on the southeast Kent coast along the Dungeness peninsula. Finally, there is the 2 ft 6 in (0.76 m), industrial Sittingbourne & Kemsley Light Railway. A limited number of charter flights are provided by Kent's Kent International Airport at Manston, and London Ashford Airport at Lydd. However, most passengers across the South East use the larger Heathrow, Gatwick, Stansted and Luton airports. In 2002, it was revealed that the government was considering building a new four-runway airport on the marshland near the village of Cliffe on the Hoo Peninsula. This plan was dropped in 2003 following protests by cultural and environmental groups. The county has four universities; Canterbury Christ Church University with campuses throughout East Kent, University of Kent, with campuses in Canterbury and Medway, and University of Greenwich (a London University), with sites at Woolwich, Eltham, London and Medway. The University for the Creative Arts (UCA) also has three of its five campuses in the county. Whereas much of Britain adopted a comprehensive education system in the 1970s, Kent County Council (KCC) and Medway Unitary Authority are among around fifteen local authorities still providing wholly selective education through the eleven-plus examination with students allocated a place at a secondary modern school or at a grammar school. Together, the two Kent authorities have 38 of the 164 grammar schools remaining in Britain. KCC has the largest education department of any local authority in Britain, providing school places for over 289,000 pupils. For the 2005–06 school year, KCC and Medway introduced a standardised school year, based on six terms, as recommended by the Local Government Association in its 2000 report, "The Rhythms of Schooling". Kent County Council LEA maintains 96 secondary schools, of which 33 are selective schools and 63 are secondary modern schools. Kent has the highest number of National Challenge schools in England, schools which are branded "failing" based on the British Government's floor targets that 30% of pupils achieve at least 5 GCSE grades A* to C. Of the 63 secondary modern schools, 33 achieved below this requirement meaning that 52% of Kent secondary modern schools (34% out of all 96 maintained secondary schools) are failing. In association football, Kent's highest ranked football team is Gillingham F.C., who play in Football League Two. There are also Kent clubs in higher levels of non-league football with Dartford and Ebbsfleet United playing in the Football Conference with Dover Athletic and Tonbridge Angels playing in Conference South. Kent is represented in cricket by Kent County Cricket Club who play at the St. Lawrence Ground in Canterbury as well as at the Nevill Ground in Royal Tunbridge Wells. Much of Kent is served by the BBC's South East region, which is based in Tunbridge Wells and provides local news for the county and East Sussex. Its commercial rival is ITV Meridian Ltd, which has a newsroom at The Maidstone Studios despite the main studio being based in Hampshire. Main transmitters providing these services are located at West Hougham, near Dover and Bluebell Hill, located between Chatham and Maidstone. Those parts of Kent closer to London such as Swanley, Dartford, Gravesend and parts of Sevenoaks lie within the ITV London and BBC London areas, taking their television signals from the Crystal Palace transmitter. The county is also served by two internet-based TV channels, Kent TV (part-owned by Kent County Council) and YourKentTV which is owned by KOS Media. The county has eight community radio stations. ^ "2011 Census, Key Statistics for Local Authorities in England and Wales - 2011 Census: KS201EW Ethnic group, local authorities in England and Wales". Office for National Statistics. http://www.ons.gov.uk/ons/publications/re-reference-tables.html?edition=tcm%3A77-286262. Retrieved 1 February 2013. ^ Glover, J.. Place names of Kent. ^ "Victoria County History of Kent". KentArchaeology.org.uk. May 2006. http://www.kentarchaeology.org.uk/Research/03/03/01C/064.htm. Retrieved 20 April 2007. ^ "Archbishop of Canterbury". Spartacus.SchoolNet.co.uk. http://www.spartacus.schoolnet.co.uk/NORarchcanterbury.htm. Retrieved 19 June 2007. ^ "Peasants' Revolt". Britannia.com. http://www.britannia.com/history/articles/peasantsrevolt.html. Retrieved 20 April 2007. ^ "Sir Thomas WYATT, "The Younger"". TudorPlace.com.ar. http://www.tudorplace.com.ar/Bios/ThomasWyatt(Sir)2.htm. Retrieved 20 April 2007. ^ The Historic Dockyard Chatham — where legends were created. Jarrold Publishing. 2005. ^ "The Dutch In The Medway". DeRuyter.org. http://www.deruyter.org/CHATHAM_Dutch_in_the_Medway.html. Retrieved 20 April 2007. ^ Oliver, Richard (1995). Ordnance Survey maps: a concise guide for historians 2nd Ed. Ordnance Survey. ISBN 1-870598-24-5. ^ "South-East England". Smuggler's Britain. http://www.smuggling.co.uk/gazetteer_se_14.html. Retrieved 20 April 2007. ^ "Medway". Communities and Local Government. http://www.communities.gov.uk/index.asp?id=1170128. Retrieved 20 April 2007. ^ "Error costs Rochester city status". BBC News. 16 May 2002. http://news.bbc.co.uk/1/hi/uk/england/1991827.stm. Retrieved 20 April 2007. ^ "UK Records". BBC Weather. http://www.bbc.co.uk/weather/features/understanding/uk_records.shtml. Retrieved 10 June 2009. ^ "English Channel". English Channel. Microsoft Encarta Online Encyclopedia 2007. http://encarta.msn.com/encnet/refpages/RefArticle.aspx?refid=761564966. Retrieved 20 April 2007. ^ a b Greensand Way in Kent. Kent Count Council. 1992. ISBN 1-873010-23-0. ^ "Kent Downs". KentDowns.org. http://www.kentdowns.org.uk/. Retrieved 20 April 2007. ^ "Geology of Kent and Boulonnais". The Geology Shop. 2000. http://www.geologyshop.co.uk/geolkb.htm. Retrieved 8 August 2009. ^ Hill, Amelia (29 April 2007). "Quake causes Kent Families to flee Homes". The Guardian (UK). http://observer.guardian.co.uk/uk_news/story/0,,2068090,00.html. Retrieved 28 April 2007. ^ a b c "Neighbourhood Statistics". Statistics.gov.uk. http://neighbourhood.statistics.gov.uk/dissemination/LeadHome.do;jsessionid=ac1f930bce6a711447e60ba4446bb56c21648d42c51.e38PbNqOa3qRe38OaNeKahqMai1ynknvrkLOlQzNp65In0?bhcp=1. Retrieved 29 March 2007. 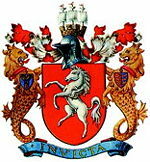 ^ Kent (Borough of Gillingham and City of Rochester upon Medway) (Structural Change) Order 1996 "Kent (Borough of Gillingham and City of Rochester upon Medway) (Structural Change) Order 1996". HMSO. http://www.uk-legislation.hmso.gov.uk/si/si1996/Uksi_19961876_en_1.htm. Retrieved 17 March 2010. ^ "Council and democracy". Kent County Council. Archived from the original on 6 February 2007. http://web.archive.org/web/20070206185542/http://www.kent.gov.uk/council-and-democracy/. Retrieved 19 April 2007. ^ "Democratically elected representatives in Medway". Medway Council. Archived from the original on 12 May 2007. http://web.archive.org/web/20070512225213/http://www.medway.gov.uk/index/council/councillor.htm. Retrieved 13 May 2007. ^ "UK MEPs". UK Office Of The European Parliament. Archived from the original on 20 March 2007. http://web.archive.org/web/20070320000145/http://www.europarl.org.uk/uk_meps/MembersMain.htm. Retrieved 3 April 2007. ^ "Hazelnut and walnut production" (PDF). Calu. http://www.agmrc.org/media/cms/050402Cobnutsandwalnuts_5A03AFB4B3709.pdf. Retrieved 15 January 2013. ^ "Regional Gross Value Added" (PDF). Office for National Statistics. http://www.statistics.gov.uk/downloads/theme_economy/RegionalGVA.pdf. Retrieved 3 April 2007. ^ "Closure of Dungeness Power Station". BBC News. 31 December 2006. http://news.bbc.co.uk/1/hi/england/kent/6203953.stm. Retrieved 3 April 2007. ^ "The Chatham News Index" (PDF). Parret & Neves. 1996. http://www.gparrett.btinternet.co.uk/chatnews/cnidx_r2.pdf. Retrieved 19 April 2007. ^ "Coal fields Heritage Initiative". Dover Museum. http://www.dover.gov.uk/kentcoal/intro.asp. Retrieved 20 April 2007. ^ "Snowdown Colliery". FreeUK.com. http://home.freeuk.com/eastkent/mining/snowdown_colliery.htm. Retrieved 19 April 2007. ^ "Charles Dickens". InfoBritain. http://www.infobritain.co.uk/Charles_Dickens.htm. Retrieved 20 April 2007. ^ "The Turner Connection". TurnerContemporary.org. http://www.turnercontemporary.org/about/?p=15. Retrieved 20 June 2007. ^ "William Golding — Biography". William-Golding.co.uk. Archived from the original on 17 March 2007. http://web.archive.org/web/20070317193534/http://www.william-golding.co.uk/p_biography.html. Retrieved 20 June 2007. ^ Kennedy, Maev (28 September 2011). "Marlowe theatre: curtain rises on Canterbury's £25.6m revamp". The Guardian. http://www.guardian.co.uk/stage/2011/sep/28/new-marlowe-theatre-canterbury. Retrieved 23 December 2011. ^ "The lost railway". BBC. http://www.bbc.co.uk/kent/content/articles/2008/05/27/history_lost_railway_feature.shtml. Retrieved 1 August 2008. ^ a b "History of the South Eastern & Chatham Railway". The South Eastern & Chatham Railway Society. Archived from the original on 1 November 2006. http://web.archive.org/web/20061101091806/http://www.southeasternandchathamrailway.org.uk/webpages/History.htm. Retrieved 22 April 2007. ^ "Failed rail franchise 'needed time'". BBC. 13 November 2003. http://news.bbc.co.uk/1/hi/england/3268719.stm. Retrieved 13 May 2007. ^ "Rail workers vote to hold strikes". BBC. 13 April 2006. http://news.bbc.co.uk/1/hi/england/4905966.stm. Retrieved 13 May 2007. ^ "New station means Eurostar change". BBC. 12 September 2006. http://news.bbc.co.uk/1/hi/england/kent/5337586.stm. Retrieved 22 April 2007. ^ Davis, Matthew (12 September 2006). "Airport plan threatens Dickens' legacy". BBC. http://news.bbc.co.uk/1/hi/uk/2093415.stm. Retrieved 20 June 2007. ^ Feature, Advertisement (23 March 2008). "Saving nature". The Times (UK). http://www.timesonline.co.uk/tol/life_and_style/related_features/love_nature/article3625154.ece. Retrieved 6 September 2009. ^ a b Garner, Richard (20 January 2007). "Call for end to selective education as 'grammar school areas' fail". The Independent (UK). http://education.independent.co.uk/news/article2169188.ece. Retrieved 14 May 2007. ^ "Grammar schools have expanded". BBC News. 26 March 2004. http://news.bbc.co.uk/1/hi/education/3571387.stm. Retrieved 3 April 2007. ^ "Kent's selective schools compared". BBC News. 17 January 2003. http://news.bbc.co.uk/1/hi/education/2666605.stm. Retrieved 13 May 2007. ^ "Department for Education and Skills". Department for Education and Skills. http://www.dfes.gov.uk/. Retrieved 13 May 2007. ^ "Kent County Council". Kent County Council. http://www.kent.gov.uk/. Retrieved 3 April 2007. ^ "Brown threatens 'failing' schools". BBC News. 31 October 2007. http://news.bbc.co.uk/1/hi/education/7070190.stm. Retrieved 4 April 2010. This page uses content from the English language Wikipedia. The original content was at Kent. The list of authors can be seen in the page history. As with this Familypedia wiki, the content of Wikipedia is available under the Creative Commons License.